WEST LAFAYETTE, Ind. — Bringing their unique mix of Mongolian folk and alternative country music, the Beijing-based band Hanggai, will perform at 8 p.m. Friday, Sept. 25, in Purdue Stewart Center’s Loeb Playhouse. Hanggai, a folk band comprised of ethnic Mongolians, is captivating the Beijing music scene with its innovative blend of traditional Mongolian music with a contemporary feel. The event is presented by Purdue Convocations in partnership with the Confucius Institute at Purdue University. While China’s capital may seem an unlikely place for a Mongolian folk revival, Hanggai (pronounced HAHNG-guy), a folk band comprised of ethnic Mongolians, is captivating Beijing’s music scene with its innovative blend of traditional Mongolian music with a contemporary feel. Led by a singer Ilchi, the former lead singer for the punk band T9, the band members dress like men of the Mongolian steppes and perform on traditional instruments, such as the morin khuur, a horse-head fiddle, and the tobshuur, a two-stringed lute. 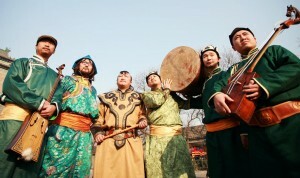 Their music also features hoomei, an age-old traditional Mongolian throat-singing technique. Tickets are $18 for adults and $15 for children 18 years and younger, Purdue students and Ivy Tech Lafayette students. Tickets are available at the Elliott Hall and Stewart Center box offices at 765-494-3933 or 800-914-SHOW. Tickets also are available through Ticketmaster outlets. Discounted tickets for groups of 10 or more can be ordered at 765-496-1977. Initiated in 1902, Purdue Convocations is among the oldest collegiate professional performing arts presenters in the United States. Each year, Convocations offers the region 30 to 40 performances of widely varying genres: Broadway-style shows, theater, dance, children’s theater, world music, jazz, and chamber music, along with rock, pop, country and comedy attractions. With a vision for connecting artists and audiences in artistic dialogue and for drawing in academic discourse, Purdue Convocations aims to promote frequent exposure to and familiarity with human cultural expression in a multitude of forms and media. Great post, sounds like an interesting style of music.